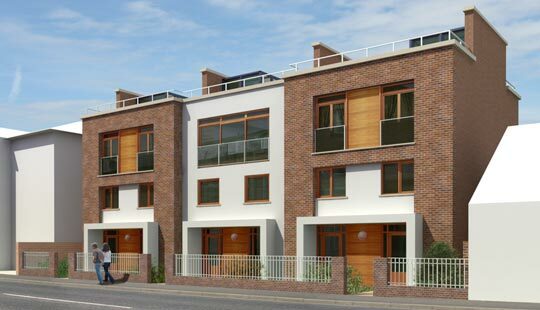 A residential development on a Town Centre brownfield site, situated on Salop Road, Oswestry, which comprised of three town houses, four mews houses and courtyard car parking. J-Ross Developments Ltd successfully re-developed this brownfield site of 977 m² (10,516 sq.ft) in the centre of Oswestry, introducing a range of high quality residential accommodation suited to modern living. The project was formulated against the required budget, programme and importantly, ensured it met the high levels of quality required. The site provided a real opportunity to redevelop but this required firstly the demolition of existing buildings, site clearance and remediation. Before the planning application was submitted, successful detailed pre-application discussions were held with planning and conservation officers. Also the identification of developments risks and constraints was conducted. The end result was the creation of seven high-quality, residential units which share amenity space along with the added luxury of secure residential car parking to the rear of the properties.